Is there anything more fun than being able to slip on a few pieces of eye-catching jewelry and heading out for a night on the town? There’s just something about statement-making pieces that makes you feel more glamorous and fashionable, and big name retailers have taken notice. If you walk into your local mall clothing store, you’ll see racks and shelves dedicated to wholesale costume jewelry. If you think about it, the fact that this style of jewelry is so popular is interesting. In the past, statement-making rings, necklaces, and bracelets were reserved for people that could afford the gemstones and gold needed to make them. In the 18th and 19th centuries, some hobbyists were able to recreate the look of expensive jewelry with less expensive metals and non-precious stones. However, costume jewelry really didn’t become a widespread commodity until the 20th century. New innovations like plastics, pastes, glass stones, and alloys of copper and zinc made it much easier to emulate the look of rare metals and stones. The mass production of goods also became more commonplace, so it was much easier and faster to produce showy rings and necklaces. Technological innovations helped make costume jewelry popular, but changing economic and social factorsreally helped make it a fashion staple. During the roaring 20s, American women had much more freedom, fashion, and prestige than they had before WWI. These newly middle class women wanted to look as stylish as the rich flappers that were gracing the covers of Vogue and other high fashion magazines. They certainly couldn’t afford to spend hundreds on their jewelry, but they were able to spend a little money on more affordable costume jewelry. The economic highs of the 20s helped make costume jewelry popular, but the economic lows of the 30s helped make it a fashion staple. During America’s Great Depression, women from all economic backgrounds were forced to cut back on their fashion budgets, and jewelry was often one of the first expenses to get cut. Many women found themselves selling their valuable jewelry to try to make ends meet, and looking to costume jewelry designers to find stylish alternatives. Soon, it wasn’t just middle class women that proudly wore costume jewelry; now, many upper class women were proudly showing off their “fake” fashions. 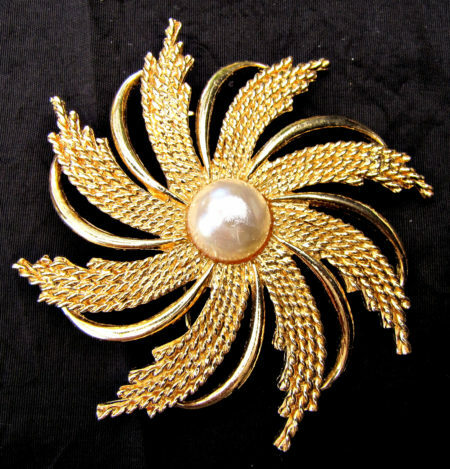 The profound shift in popularity had most people rebranding their “costume jewelry” as “fashion jewelry.” Soon, women on the silver screen were wearing costume jewelry, and movie stars and fashion icons like Elizabeth Taylor and Jane Russell became spokeswomen for costume jewelry designers. Coco Chanel, one of the most prolific fashion designers of the 20th century, even designed some costume pieces for Jackie O. and Audrey Hepburn. Modern day costume jewelry has continued this tradition by developing ethnic styles, modern design elements, and classic looks for a new generation. If you sell jewelry, buying wholesale costume pieces is as lucrative as ever! Check out Olympia Gold’s excellent selection for your store, kiosk, or other business today!